Home » Posts Tagged "wifi thermostat"
I’m quite a big fan of writing code that interfaces with physical data. It somehow feels more fulfilling to see or feel the results. 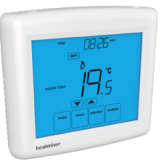 On top of my repertoire of the Foscam FI8908W Recorder and TK110 GPS Tracker Server, comes a PHP interface for HeatMiser WiFi Thermostats. This too can be found on GitHub. The code is fairly self explanatory and the docs should point you in the right direction. The library will read from and write to HeatMiser WiFi thermostats. It’s tested on the PRT-TS but should probably work on others. If not, fix it up and submit a pull request on Github (or comment here). If you came looking for an insight into this Theromstat’s binary network protocol, there’s a decent guide released by HeatMiser on the topic. This can be found on their website. The guide can be a lot to get your head around so hopefully my code will be enough to aid you in this area. Failing that, or if you’re more of a camel, there’s a good Perl implementation on Google Code. The Perl implementation is more of an example than an interface-able library but it’s a great starting point and provided a lot of inspiration for my PHP implementation.